Treadmill is the machine made to force you to walk. It motivates you to go further and train your muscles. Although the people invented cars and motorcycles in order to come faster from one place to another, good old walking survived in the gym. The treadmill will make you walk for an hour or even more, and you will push yourself further, to an additional mile. Some of the people working on the treadmill will train for the marathon, other to stay fit and some will be there in order to lose some extra pounds. If you want to start losing some weight treadmill might be your best friend in this battle. All your body needs to start burning the calories are cardiovascular physical exercises, such as walking, jogging and running. These exercises involve large muscles of the body, such as leg muscles, which use more energy and burn more calories than some other muscles. In the gym, the most common cardiovascular exercises are the treadmill and the exercise bike. Some people use the treadmill every day for 10 to 15 minutes and others do just the treadmill couple a days of the week. For the beginners, perhaps the best cardio training is about 20 minutes every day. Start with a speed of 5km/h and gradually increase the speed to around 6.5km/h so you can survive the 20 minutes of that pace. Take your own rhythm and walk. It is especially good exercise for the people who never trained anything and also beneficial as the warm-up for all others. If you are fit enough, you might skip the walking part and go straight to the run on the treadmill. Start with light jog of about 10km/h and increase or decrease the speed of the treadmill machine, whatever you are comfortable with. The specialists recommend running on the same pace for the whole workout on the treadmill. Be careful not to exhaust or injure yourself. 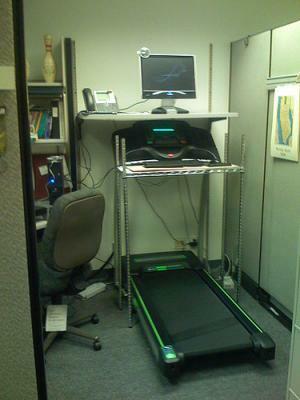 Treadmills also have an extra function. There is an incline function, which elevates the end of the machine, giving you the impression you are walking or running uphill. It is more difficult then walking or running but it also burns much more calories. Treadmills may be adjusted to interval workout. The machine sets the changes in the incline and you should adjust the speed of your movement. This type of exercise is also more challenging. Can I rely on calorie countrers on exercise machines? What are your experiences with treadmill training?